Lapp offers an extensive range of data cables, however as the UNITRONIC® BUS PB ROBUST cable's outer sheath is made from special TPE it is designed especially for use in harsh environmental conditions. Its material make up offers significantly extended use in various application areas as well as increased water and chemical resistance. This certifies it as ideal for applications within the Food and Beverage industry. This PROFIBUS cable also has additional UV resistance and flame-retardant product features. For our full range of Data Cables click here. This EMC-compliant high-end servo cable, allows a much faster speed and acceleration which increases the economic efficiency of the machines. It has an Extended Line for heavy duty in power chain applications due to its PUR sheath, making it an ideal solution in fast paced production and assembly lines. Polyurethane sheathing offers a tear resistant material with high tensile strength combined with a high resistance to tangling and knotting. This cable has also proven to work particularly well in wet areas of machine tools and transfer lines. For our full range of ÖLFLEX® servo cables click here. 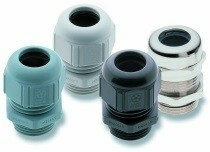 We can provide you with a range of cable glands to match our extensive cable range. Made from stainless steel or nylon the cable glands have also been designed to meet your industry requirements. The world renowned cable gland is now approved to IP69K in accordance to DIN 40 050. The IP69K rating enables the use of SKINTOP® even under the harshest cleaning procedures with high pressure cleaners and hot water. The glands are exposed to 80°C water vapour and 100 bars pressure from various directions at a close distance. To view our full range of SKINTOP® glands click here. For information on a selection of our Power and Control cables suitable for the Food & Beverage industry click here. Or for a full range of Lapp products visit our online catalogue.